Another day up the mountains, this time with Alex. We were excited for a couple of days up high with the aim of completing 3 routes, This turned into one because of a few different reasons, but the one we completed was amazing. Starting up another last bin at the Midi we were aiming for the Perroux hut for another bivi, after helping some English 50 something year old put on his harness and crampons we escorted him down the arete and off to the Cosmiques refuge where he would await his guide, If we were not there who knows what would have happened to him. 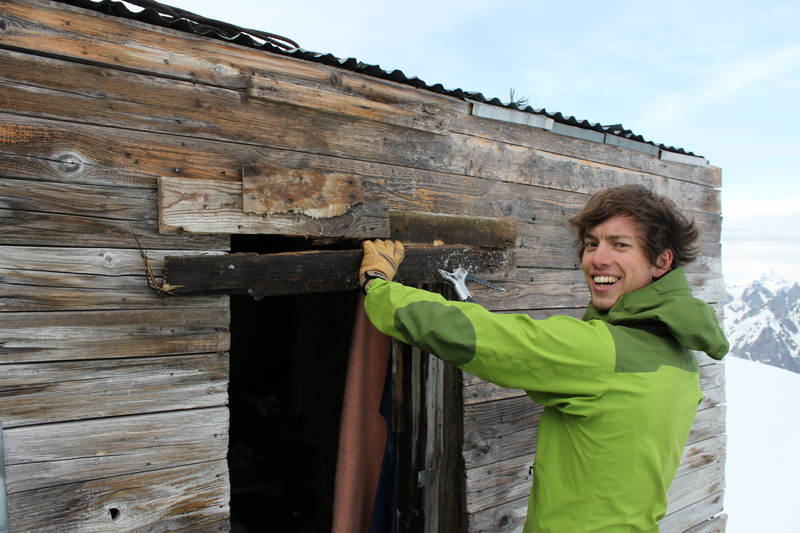 Before we settled in and started cooking some food we took time to fix the door on the small old hut, this meant digging out some ice, clearing the door way and salvaging some nails, we made that baby wind proof and were chuffed with our refurbishment’s so started cooking some ravioli and noodles, it was the first time I had used the hammer on my axe, not sure if that is its intended purpose! We were in bed early for a 3am wake up and out by 4am after some coffee, orange juice and a couple of cereal bars. 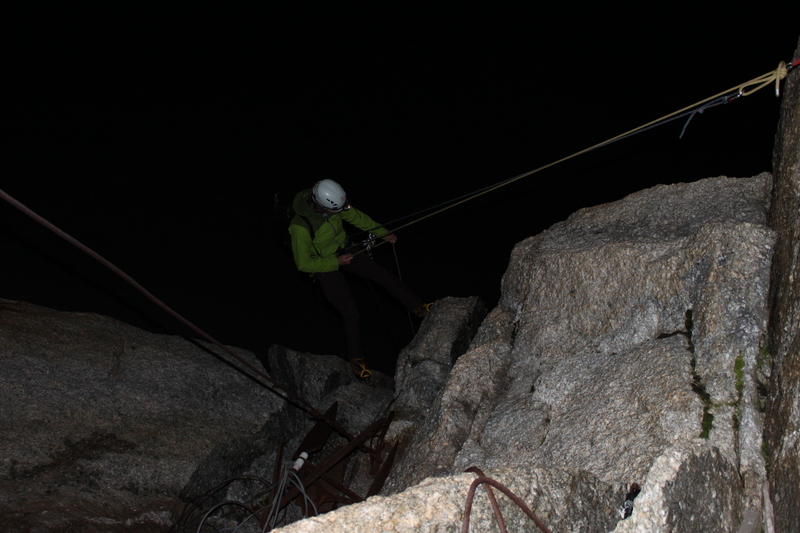 Rapping in to the dark is good fun and we were on the move roped up just after 4. After a 1hour 15min approach we started heading up the snow slopes with only one team of two ahead who were pitching the north face, We caught them up before the ice and passed them soon after. The conditions were perfect, re-frozen snow at the bottom then neve all the way to nice ice in the middle with good neve on the upper snow field. 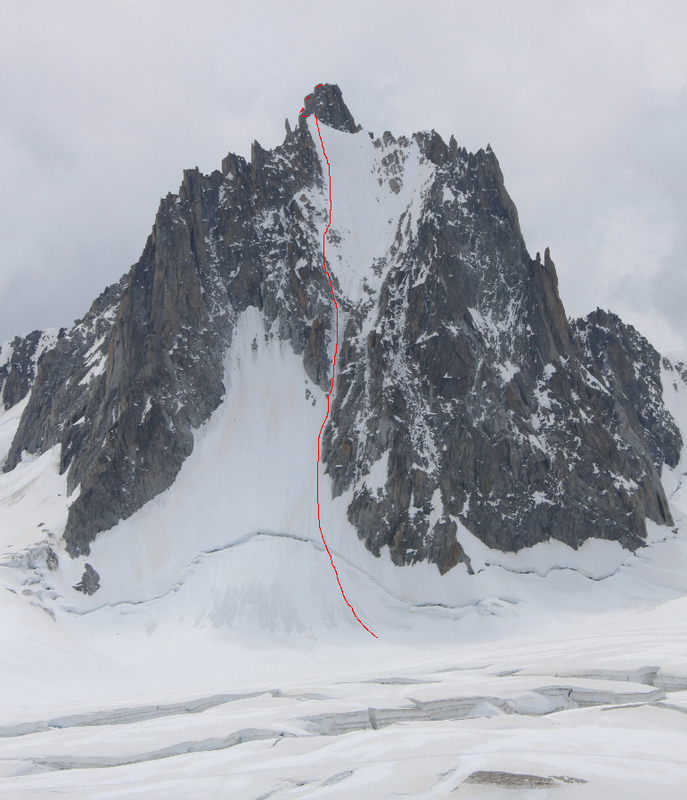 We opted to take the left couloir with a longer ice section, this took us higher up the upper snow field and was great fun with a small rock and ice crux at the top. 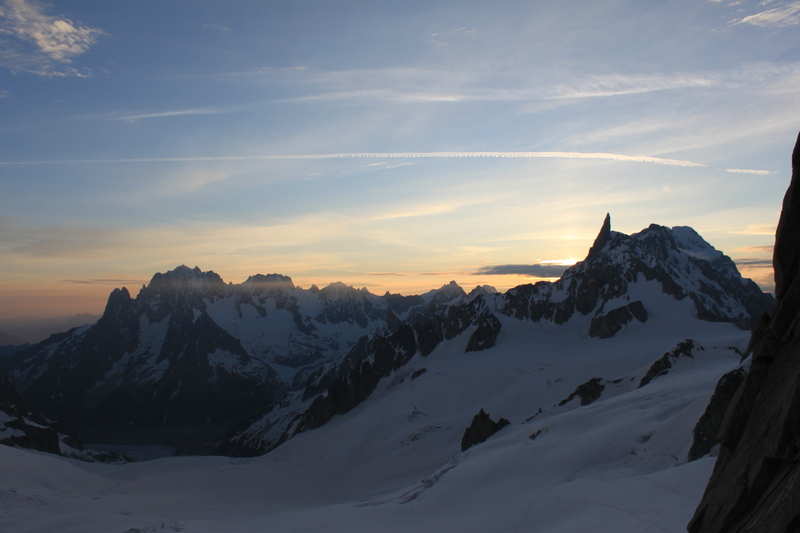 The sun started to come up as we were half way through the ice offering amazing sunrise views down the Vallee Blanche with the sun coming up behind the Dent de Geant. 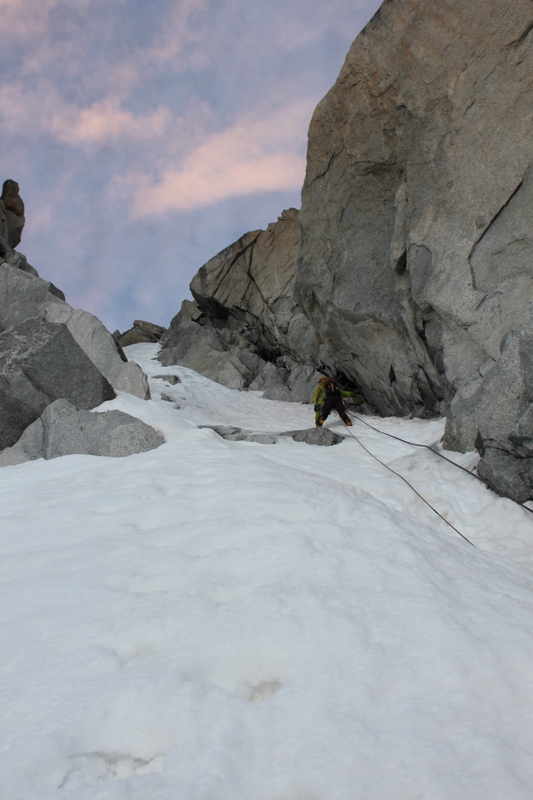 We were along side the other team at this point as they decided to get out onto the upper snow field as soon as they could, leaving us to have the whole left hand ice couloir to ourselves. 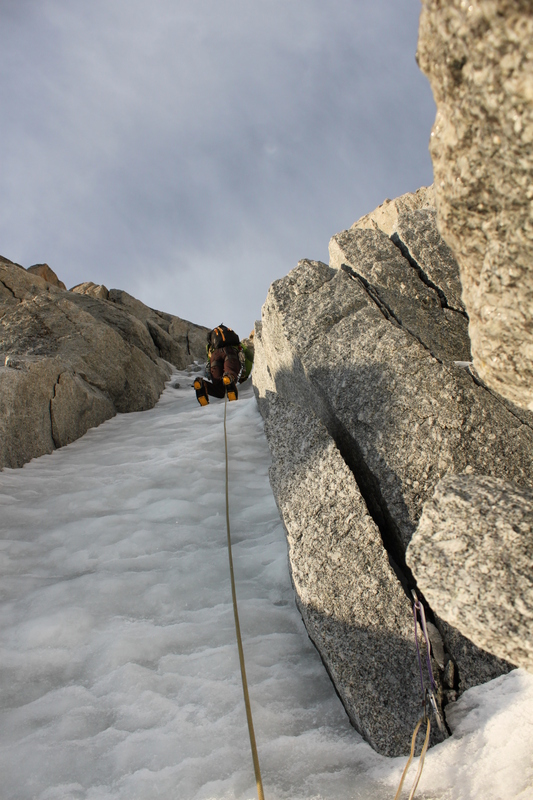 After the tricky moves we were out onto the upper snow slope and heading towards the summit. After 2 hours of climbing we were on the summit and we sat and enjoyed the views for about 45 minutes whilst Alex looked for his sunglasses unsuccessfully. 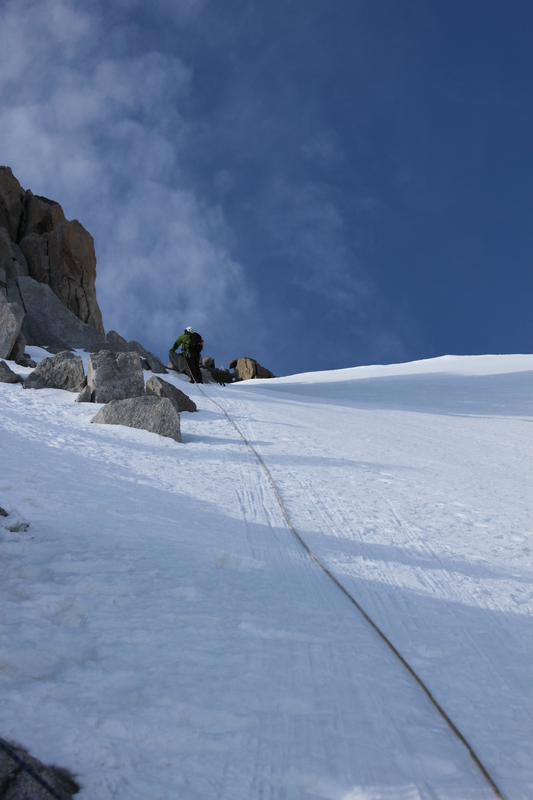 After borrowing some goggles from a German Guide we headed back down the East ridge with not enough time or the correct glasses to climb the Entreves traverse which is what we wanted to do after the Ronde. 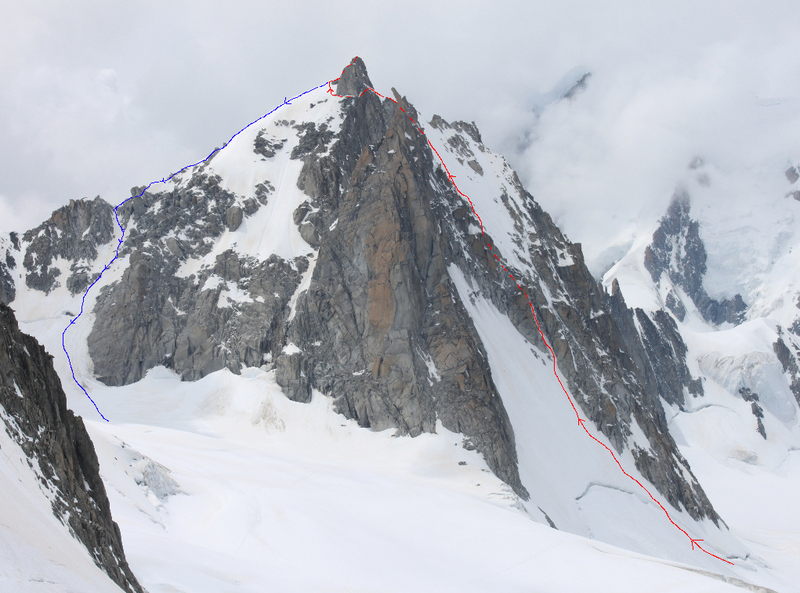 We then headed back to the Helbronner and came back to the Midi, we bailed on our plan to stay at the Torino hut and climb the Dent du Geant the next day as the weather did not look good in the afternoon and I could not afford to be stuck in Italy the following night! 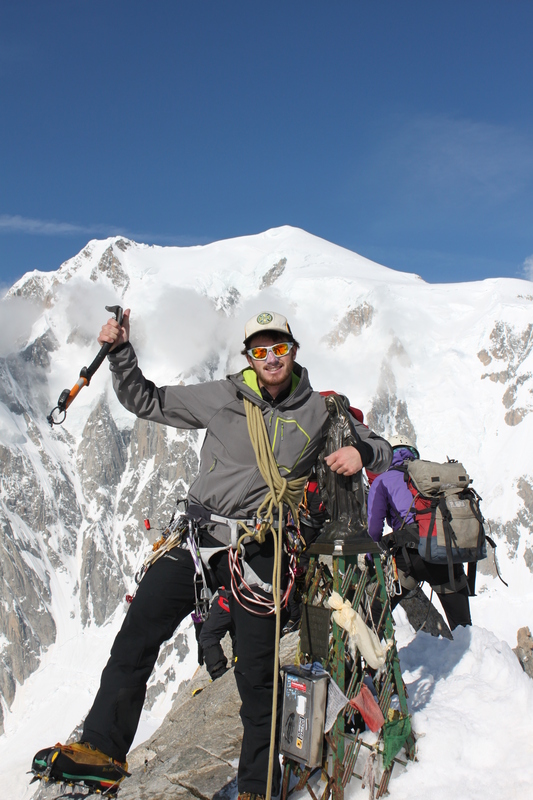 The next day me and Alex went to retrieve our sleeping bags from the Perroux and came back up the Cosmiques arete, we did the round trip Midi to Midi in just over a hour and had great fun in the sun wearing t-shirts! A great few days in the mountains and I am really pleased to have climbed the North Face of the Tour Ronde, something I have wanted to do for a couple of years and my main objective for this summer.